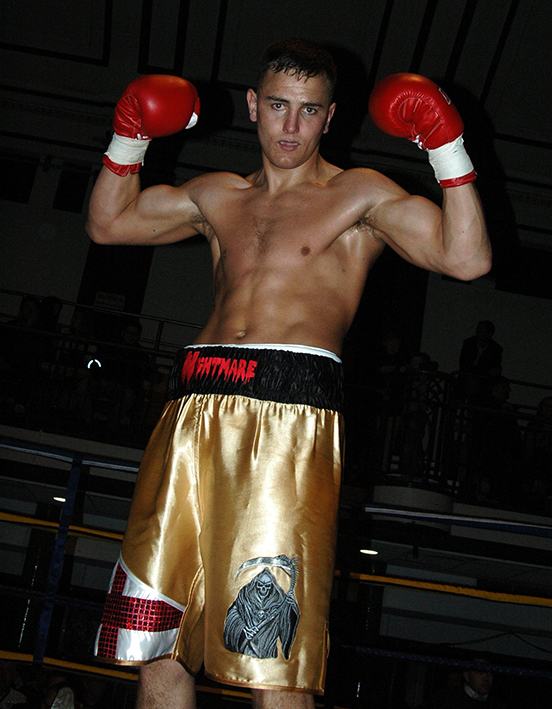 Bardney, Lincolnshire Middleweight Nathan ‘Nightmare’ Decastro (pictured) makes his third professional outing this coming Saturday, when he takes on Lithuania’s Deividas Sajauka on the Dave Murphy Acourtier Events promoted CAPITAL PUNISHMENT at York Hall in Bethnal Green, London. Back in March, Nathan made a sensational start to his pro career, stopping Paulius Butvidas after just one minute and five seconds of the first round. On August 2nd Nathan made his second pro outing, scoring a shut out points win over Sergej Drob. However to put this result in context it was just the Monday prior to the fight that the cast on his leg was removed, following a serious ankle injury just a few weeks earlier. It’s this kind of determination to succeed and overcome all obstacles, as well as Nathan’s exciting all action fight style, that has prompted his promoter, Dave Murphy, to publicly state that Nathan is one of the most exciting prospects in the division, as well as his charge being a future Champion. Speaking from his home Nathan spoke briefly on his upcoming fight. “I don’t know anything about my opponent, other than he’s never been stopped, but that’ll change on Saturday night. I’m fully fit this time, last time I fought I couldn’t train properly or even do my runs and it showed. I was throwing all the right punches but just couldn’t get the power in them as normally I would. My ankle was still a little weak and I think that affected me subconsciously, no such handicap this time. I’m ready to live up to my ring name again, I will be his worse nightmare on Saturday, I will be all over him like a rash. Nathan Decastro, against Deividas Sajauka, features on the undercard of the Baz Rehman sponsored Marianne Marston versus Marianna Gulyas MBC International title clash, takes place on the Dave Murphy Acourtier Events promoted CAPITAL PUNISHMENT mega event at York Hall in Bethnal Green, London, on Saturday, 25th October 2014. Tickets, priced £35 (Standard Seated) and £60 (Ringside) are available from Nathan on 07841 968414 or from any of the boxers taking part, on-line at www.tkoboxoffice.com and www.acourtier.com - or call the ticket line on 07960 850645 or 07809 499896.